New worksheet based on a previous worksheet that you have made. New worksheet based on a worksheet shared by another member. Select a worksheet generator from the "New Worksheet" menu at the top of the page. To get a summary of each worksheet type you can browse the Worksheet Generators Index. If you want Quickworksheets to automatically use your previous settings when creating a new worksheet, you can enable this on the Edit My Details page. After this is enabled, the second time you create a "Word Scramble" worksheet, for example, Quickworksheets will use the same font, footer, picture and other settings that you used for the previous "Word Scramble" worksheet that you created. You can use a previously created worksheet as a template for a new worksheet. To do this simply click on the title or icon of the existing worksheet that you want to use on the My Worksheets page. NOTE: If a worksheet is a 'draft' that has not yet been finalised, then clicking on its title will load the draft for you to continue to edit instead of creating a new worksheet based on this one. Draft worksheets will be indicated by a "Draft" tag as pictured below. 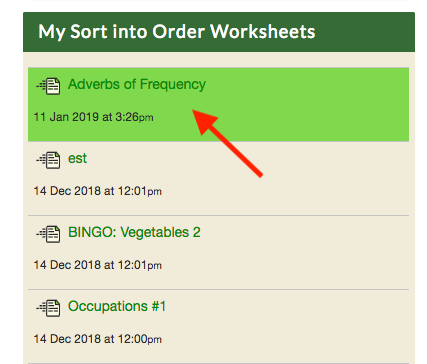 You can also create a new worksheet based on a recent previous one by clicking on the title in the sidebar when viewing any worksheet generator. You can use a worksheet that another user has shared as a template for a new worksheet. You can do this by going to the Shared Worksheets library, choosing a shared worksheet, and then clicking "Use as Basis for New Worksheet". You will then be able to customise the worksheet content to suit your needs.